Soft Air Thompson M1A1 Full-Metal Body AEG airsoft gun replica Airsoft rifle is an incredibly accurate and closely modeled vision of the original. This gun jams rarely, shoots accurately and has weight enough to make you feel as awesome as you will look. The Thompson’s intimidating mobster like quality will have your opponent’s adrenaline pumping as you saunter across the battlefield like George “Baby Face” Nelson. The plastic imitation wood is beautifully painted and provides weight reduction necessary for long term play without sacrificing structural integrity. Holding nearly four hundred rounds with an automatic fire setting the guns metal innards hold truer than several competitors that cost more as it lays down covering fire for your team. Refilling ammunition while in battle is made easier with the stick magazine rather than the classic drum magazine one might be used to seeing on a “Tommy Gun” but for the sake of functionality, I find that this sacrifice in looks is relatively insignificant. There are a few minor hiccups in design where the battery housing is concerned however it does not seem to affect the gun’s performance. For high quality at a low price range, this is the perfect gun for a person who does not know about Airsoft rifles to get their feet wet with. 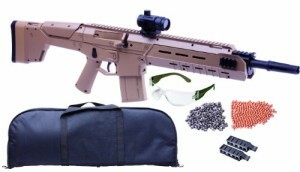 This Crossman Air Rifle is a Bushmaster ACR replica that looks and feels very similar to the true assault rifle. This is not the Red Ryder BB gun from A Christmas Story though it still can accurately put an eye out so be careful. The fire rate would make this more of a really nice piece to show your friends rather than to play a game of Airsoft with and you might want to be careful where and when you have it out it looks intimidating for obvious reasons. This pump action pellet/ Airsoft rifle could be a fantastic purchase for a father trying to teach his son gun safety, or just to play around with in the backyard on Sunday. With out a doubt no can of soda will stand a chance. This model rifle is a left handed model though not a deal breaker it does make cocking it a little harder than it would be with other models. One may also consider purchasing iron sights for this gun as they are typically more easily sighted in than the red dot. This is not only an Airsoft gun and therefor parents looking to purchase this for children should monitor them even more closely than they would while their children were playing a game of Airsoft, the safety applications to prevent severe injury from plastic BB’s is far less effective against medal pellets. 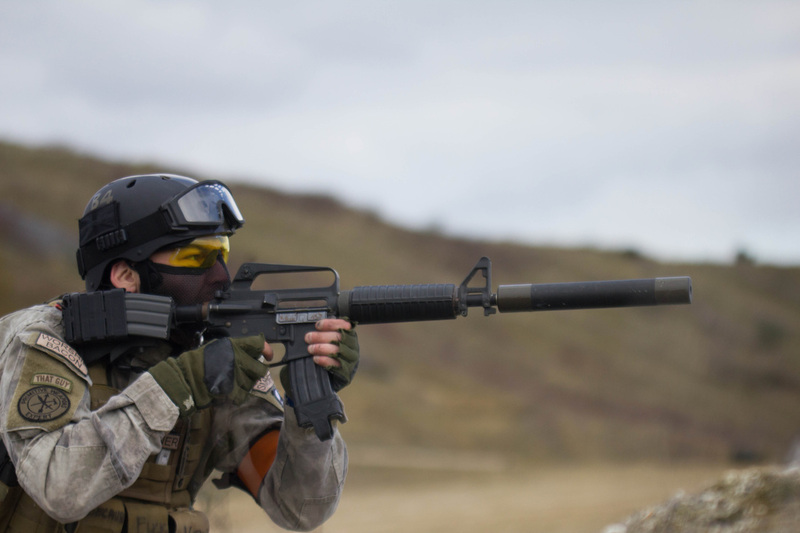 The Pulse R76 Airsoft rifle is an accurate, sturdy gun; with a remarkable fire rate and range that will make you question the purpose of Airsoft sniper rifles. The Pulse R76 is an electric powered fully automatic rifle with a removable stock that allows for maneuverability in close quarter combat. The battery charge holds for long periods of time and is not held within the stock so that it is not a problem with the stock is removed and weight is more centered. With rails for attachments like sights, lights, etc. 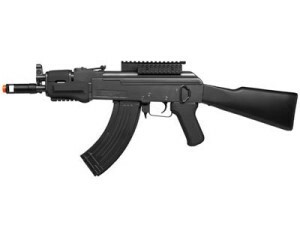 this gun is perfect for those fans of Call of Duty’s AK74U. With the reliability of the Crossman brand behind it, this gun will outlast even the most energetic children. For the low price of only about eighty dollars the quality of this gun cannot be beaten, the gearbox is full metal and designed for power and precision. It should be mentioned that all of the aforementioned guns are not toys and should be used by people under the age of eighteen only under close adult supervision. Best Sniper Scopes of 2015 SIG Sauer P226 Airsoft Pistol Review Find the Best Airsoft Sniper Rifle For You Are Cheap Airsoft Guns Reliable?